In order to exercise the brain, Sathya taught himself how to juggle. In this image he shows off his talent for friends and family. I recently had the opportunity to photograph a retirement party for one of the smartest individuals I've met in a very long time. His name is Sathya and after 30 years of working for the Food and Drug Administration he's ready for new challenges. With a PhD in biology, Sathya plans to further his education by learning about the brain. His interest in neuroscience lead him to learn how to juggle. It's one of many ways that Sathya keeps his brain limber and ready for what is next in life. 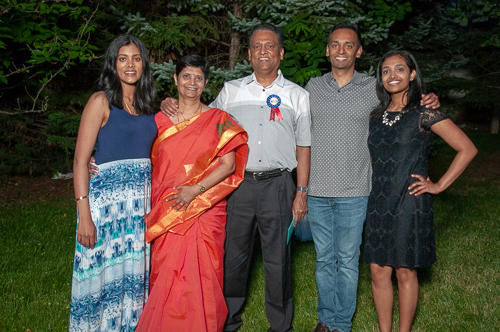 Having the opportunity to photograph Sathya's family and friends was a true pleasure. I listened with great interest as his family and friends shared personal stories of how he has influenced their lives in one way or another. It was a touching moment as Sathya shared his thoughts and gratitude with everyone who attended. Thank you, Sathya, for enriching my life with your words of wisdom! Check out the rest of the photos here! An exceptional man supported by his wonderful wife and best friend. A very happy Sathya poses with his family. If was obvious in his words and actions how proud he is of everyone!